The inner ear is involved in control of balance and hearing. Occasionally calcium carbonate crystals which have broken loose from one part of the inner ear, settle on or near nerve fibers which detect spinning movement within the balance part of the inner ear (semi circular canals). This can happen with no apparent reason or follow a head injury or viral inner ear infection (viral labyrinthitis). Certain head position will then cause movement of the calcium crystals and result in stimulation of nerve fibres. The nerve fibres send signals to the brain and the eye telling them that your head is spinning when it is not. This causes intense dizziness and can lead to nausea and occasionally vomiting. Turning in bed, lying back, getting out of bed or looking up or down (with head tilt) can bring on the dizzy spells. Usually one side is worse than the other. 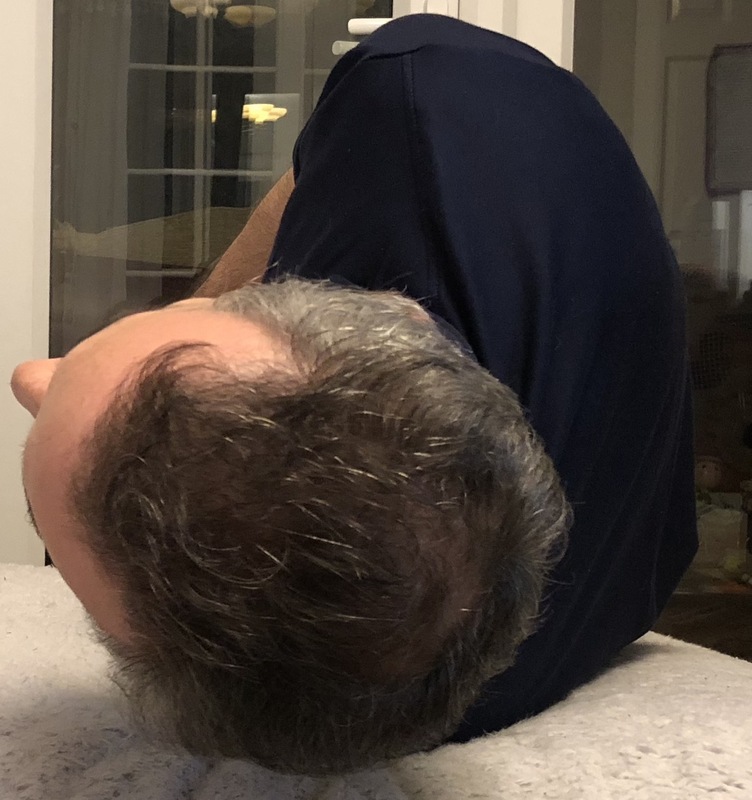 If you keep your head in the position that brings on the dizziness and keep it there the spinning sensation disappears within 60 seconds (although the nausea may last longer). Most people however, try to avoid any position which may bring the dizziness on. It is important to realise that this type of dizziness (know as benign paroxysmal positional vertigo (BPPV)) is not a serious problem and can usually be treated fairly easily. Most patients have periods of spontaneous improvement and deterioration. Other conditions such as migraine associated vertigo can cause a similar problem. A simple test called the Dix Hall Pike manoeuvre can detect active BPPV. The inner ear has 3 Semi-circular canals (posterior, lateral (also known as horizontal) and super (also known as anterior) canal. These pickup rotational movement of the head and send signals via the brain to the eye muscles to keep the eyes on a target while the head is moving. In most case of BPPV the problems is in the posterior canal. 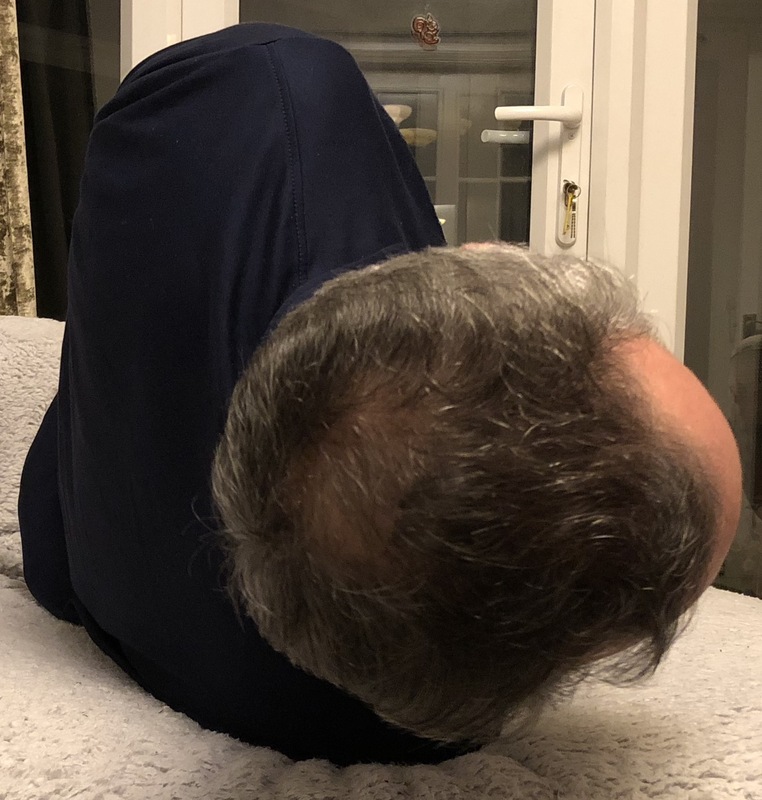 Patient experience vertigo/dizziness when their head is tilted back (i.e when looking up) or down or if they rollover in bed towards the affected side. In rare cases other canals may be affected. I have personally only ever seen Lateral (Horizontal) canal BPPV after the Epley manoeuvre (see below). Patient with Lateral (Horizontal) Canal BPPV may feel dizzy when turning their heads from side to side or when tilting their head down or up. Lateral (Horizontal) canal BPPV generally resolved spontaneously but specific treatment are available for this. I have never seen a convincing case of Superior (Anterior) Canal BPPV. I suspect most cases which may be considered Superior (Anterior) Canal BPPV may be due to central vestibular problems (problems in the balance part of the brain rather than the inner ear). Often the story is fairly typical. 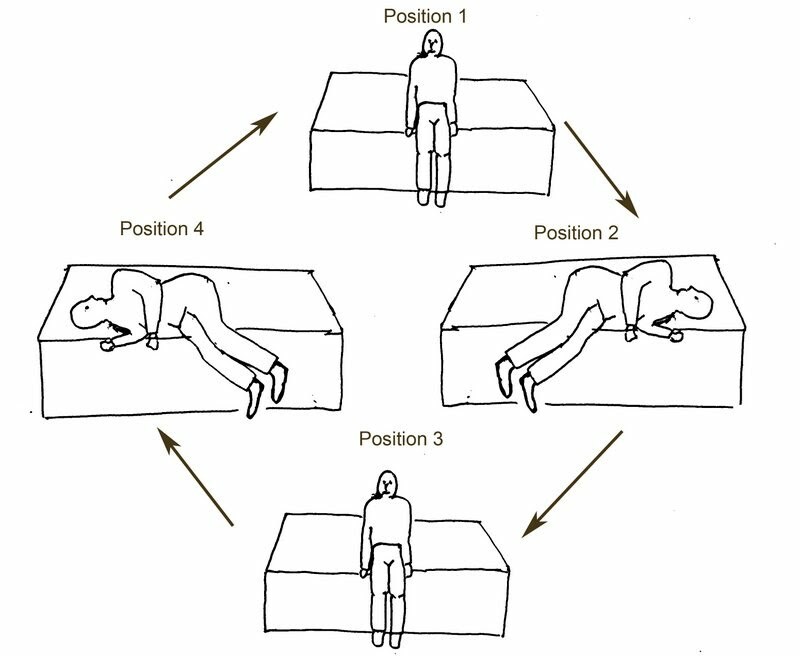 Patients experience short-lasting (10-20 seconds) spinning sensation when lying down, getting up, turning in bed to tilting their head forward or back. A test manouvre (Dix-Hallpike Test) can detected the abnormal eye movement when a patient is put back into a lying position which bring on the dizziness. See video below. In most cases BPPV improves by itself. BPPV does not usually benefit from treatment with medication or drugs. Some people will benefit from a special treatment designed to reposition the crystals back to where they belong. As most cases involve the Posterior Canal most of the treatment hear aim to clear this canal of the crystals. Various manoeuvres including the Epley and Semont manoeuvres are used to treat Posterior Canal BPPV. These involve a series of head positions which your ENT doctor, audiologist or you (with help) can carry out. The aim of these manoeuvres is to move the calcium crystals from the part of the inner ear where they are causing the spinning sensation to another part of the ear where they normally belong. The manoeuvre will cause some dizziness while it is being carried out and occasionally for the few hours afterwards. Most patients improve after the manoeuvre. Occasionally the manoeuvre has to be repeated. 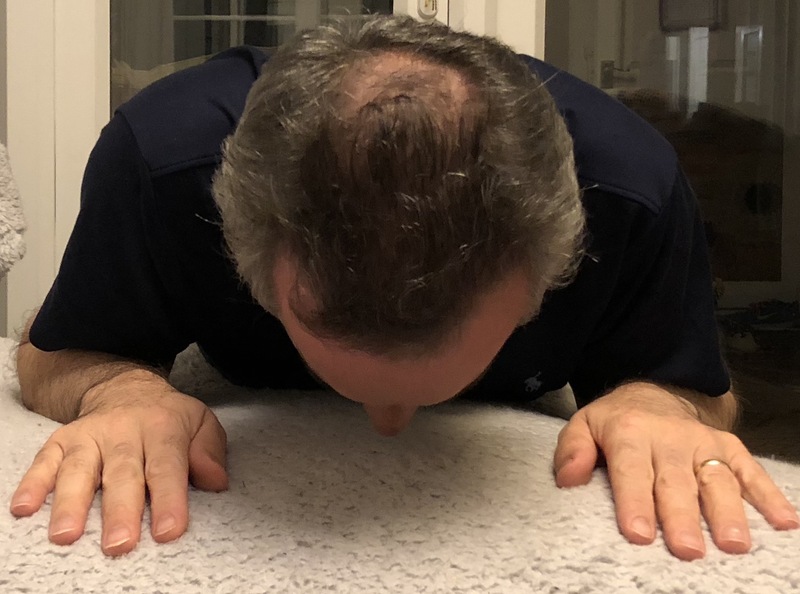 Another treatment method is the Brandt Daroff exercises. These involve regular daily exercises to help disperse the crystals in the inner ear. BPPV occasionally recurs after weeks, months or years. It can be treated again. Below are instructions on how to carry the Epley manoeuvre, Brandt Daroff exercises and Semont Manoeuvre. For the Lateral (Horizontal) Canal BPPV the log roll manoeuvre is required. This shown below. The Epley manoeuvre is designed to remove the calcium crystals from the part of the inner ear where they do not belong. The dizziness can resolve after doing the manoeuvre once. If the dizziness persists the manoeuvre can be done repeatedly until you are symptom free. In some cases it will not work. When carrying out the Epley manoeuvre, spinning dizziness occurs. This is to be expected. It does not mean you are doing the exercises incorrectly. If after doing the manoeuvre 4 or 5 times correctly it has not worked it is unlikely to work. It is important that you have the manoeuvre demonstrated to you initially by a specialist. This leaflet is a guide to help you remember.There are some good demonstrations of this on YouTube. You will need ten minutes to perform the Epley Manoeuvre. It is best to have help from a family member or friend. It is best to perform the Epley Manoeuvre on your bed. Sit on the bed with a pillow behind you. 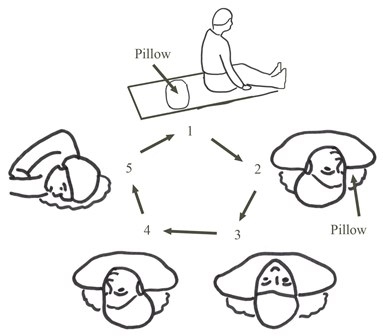 The pillows should be in a position such that when you lie back the pillow will be between your shoulders. If the dizziness is caused by turning your head to the right, start by turning your head 45° to the right (see figure 1). 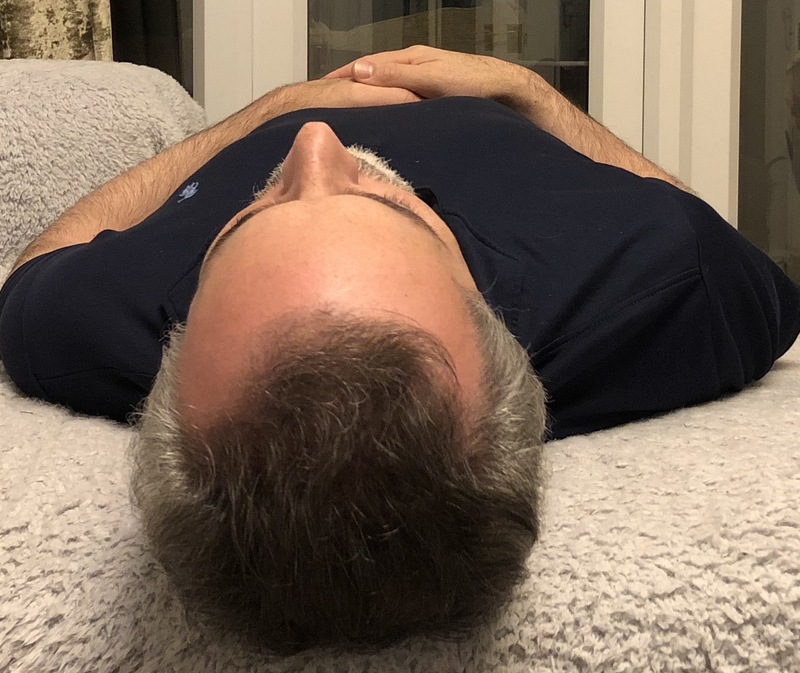 Lie back rapidly keeping your head turned to the right so that your head hangs off the end of the pillow by about 30° (figure 2). At this point you’re likely to experience dizziness. The dizziness will last for approximately 1 minute. Wait for a further 30 seconds after the dizziness has finished and turn your head to the middle i.e. looking straight up (figure 3). Again if you experience some dizziness wait until this has stopped. After a further 30 seconds turn your head 45° to the left (figure 4). As before wait 30 seconds after any dizziness has stopped before the next move. The next step involves turning over onto your left shoulder. Your head will be turned to face into the bed i.e. looking down (figure 5). Again wait for any dizziness to stop and after a further 30 seconds sit up. It is important that as you sit up you keep your head turned to the left. When you sit up you will feel dizzy for a few minutes. This is normal. Do not lie down for 4 hours after carrying out the Epley Manoeuvre. If your dizziness occurs when you turn your head to the left then start by turning your head to the left, then to the middle, then to the right and finally face down towards your right shoulder (i.e. a mirror image of the above description). You will need to discuss with your doctor if the symptoms do not improve after carrying out the Epley Manoeuvre on a number of occasions. Epley Manoeuvre (for right ear). Unlike the Epley manoeuvre which is a one-off (although it does need repeating on occasions) treatment, the Brandt-Daroff exercises are carried out regularly over a period of 2 to 3 weeks in an attempt to disperse the crystals in the semicircular canal of the inner ear. Brandt-Daroff exercise can be used to treat left and / or right ear BPPV. They may also help treat both Posterior and Horizontal Canal BPPV. Therefore it is not absolutely necessary to know which canal or ear is involved when carrying out the Brandt-Daroff exercises. Sit on the edge of your bed with enough room to allow you to lie down sideways to left and right. If you find that the BPPV is brought on by lying down with your head turned to the left then starts the exercise by lying on your left side. If the dizziness is brought on when you turn your head to the right then start the exercise by lying on your right side. If you are not sure starts by lying on the side that seems to make you feel worse. Turn your head such that you are looking above the horizontal. I.e. if you are relying on your left side your head should be turned to the right. This 1st position may bring on the dizziness. It should subside after 30 to 60 seconds. After the dizziness has stopped weight gain another 30 seconds. If there is no dizziness simply wait 30 seconds. Then sit up. Wait for any dizziness to stop. Wait another 30 seconds. Now lie onto your opposite side again with your head turned to face above horizontal. Again wait for any dizziness to stop and wait another 30 seconds. Then sit up. You have performed one repetition. Repeat this 5 times. Repeat the whole exercise 3 times in a day for 2 weeks. This is also a manoeuvre which can be carried out once or a few time. It works in a similar way to the Epley manouvre but is quicker. It is demonstrated in the videos below. Recently a new “home”remedy treatment has been developed. The patient first sit upright in their bed. Then the patient lies back with the head facing the ceiling for for 3 min. The patient then rolls over on to the “healthy” side. i.e. the side which does not generally make them dizzy. They should stay in this position for minimum of 30 minutes. This can be done every bed time. The reported success rate is 89 % after 1 week and 100 % after 2 weeks. This is rare. I have only seen cases occurring after treatment of Posterior Canal BPPV. This occur due to the relocating crystal falling from the poster canal into the lateral (horizontal) canal. Patient experience dizziness if they turn their head from side to side or if the head is tilted down or up. The sensation of spinning will be in the horizontal plane. See video below of the nystagmus (abnormal eye movement) occurring during Lateral (Horizontal) Canal BPPV. Assuming the left ear is affected. Start by lying on a bed on you side with you left ear down. Wait for any dizziness to settle plus 30 seconds. Roll over on to your back facing the ceiling. Wait for any dizziness to settle plus 30 seconds. Roll over on to your side so that you right ear is down. Wait for any dizziness to settle plus 30 seconds. Roll over onto your face (you can lift you face up a little to allow you to breath!). Wait for any dizziness to settle plus 30 seconds. Then sit up. Assuming the right ear is affected. Start by lying on a bed on you side with you right ear down. Wait for any dizziness to settle plus 30 seconds. Roll over on to your back facing the ceiling. Wait for any dizziness to settle plus 30 seconds. Roll over on to your side so that you left ear is down. Wait for any dizziness to settle plus 30 seconds. Roll over onto your face (you can lift you face up a little to allow you to breath!). Wait for any dizziness to settle plus 30 seconds. Then sit up.